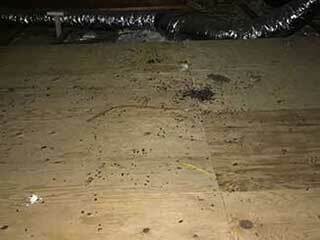 Rodent proofing a house is no easy task. While the major efforts should be left to professionals in order to ensure every possible entry points are properly sealed, there are some actions that you the homeowner can take to protect your house. Check the insulation in your attic for signs of nesting. This includes shredded or damaged material or actual visible nests. If you find evidence of rodent activity, you'll need to have them removed as quickly as possible. Rodents get into our homes because they can smell food. So we need to make it harder for them. Clean the kitchen frequently and make sure no crumbs are left behind. Store food, especially grains and seeds, in airtight containers and not in cardboard boxes that rodents will be able to chew through. Don’t leave uneaten pet food around and always store it in sealed containers too. Also, make sure you take the trash out every night. Rats like to build nests and burrow in overgrown vegetation or discarded trash, and they can also reach your attic by climbing on nearby trees. To prevent this, you can trim branches that are adjacent to the walls and roof of your property, clear dense vegetation from your yard and remove leaves on a regular basis. The proofing process always starts with a thorough inspection of the entire house, focusing on the attic, crawlspace and roof areas. This is something you'll want to let professionals handle, as even supposedly minor gaps and cracks can provide mice with a way to get inside your home. All gaps, cracks and holes that are found, including the spaces around electrical cables and pipes will need to be sealed either with special foam, copper mesh or sheet metal, depending on their size and location. All doors and windows should also be checked for broken frames and repaired if needed. You should also ensure all your external doors have high quality door sweeps or strip brushes that can prevent rodents from sneaking in. Give our experts at Attic Cleaning San Jose a call to make sure your property is properly protected.